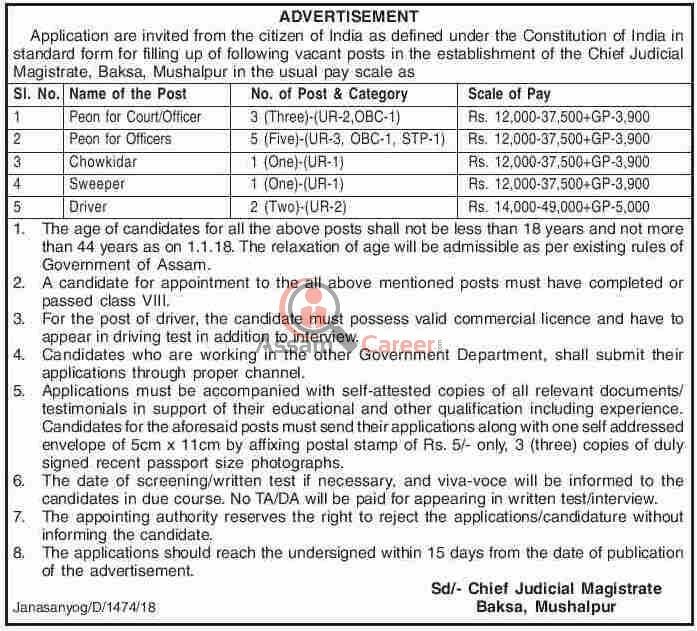 O/o Chief Judicial Magistrate, Baksa. Educational Qualification: A candidate for appointment to the all above mentioned posts must have completed or passed class VIII. For the post of driver, the candidate must possess valid commercial licence and have to appear in driving test in addition to interview. The date of screening/written test if necessary, and viva-voce will be informed to the candidates in due course. No TA/DA will be paid for appearing in written test/interview. The applications should reach the undersigned within 15 days from the date of publication of the advertisement.